DESCRIPTION Welcome to the Prestigious Riverstone building in the heart of Mission nestled along the Elbow River. 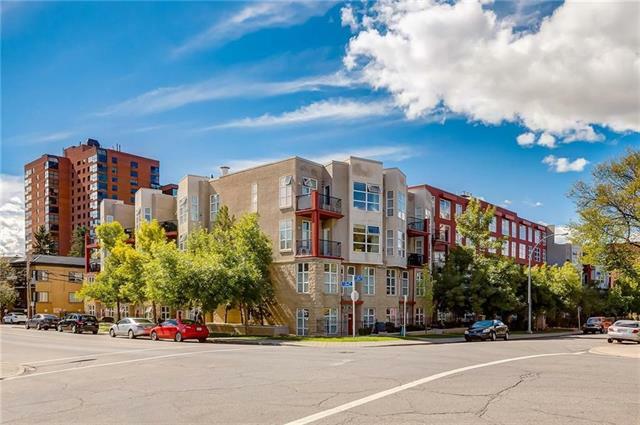 Stunning 9th floor condo offering a birds eye view to the South over the Elbow River, views to the East and sparkling downtown views to the North. The Master Suite with its downtown skyline views offers his and her closets, a 5 pc bath incl. a towel warmer. A large second bedroom as well as a main 3 pc. bath. Nice sized storage / laundry room and an ideally positioned underground parking stall. The living and dining room are generous in size and well appointed for entertaining. The kitchen was previously renovated in a traditional style giving off a more homey feel. HW floors could use a refinishing as per price. Riverstone offers an array of amenities including: 24 hour concierge, indoor pool/hot tub, tennis court, gym, guest parking, social room, car wash and more. Only 1/2 a block to 4th Street with a plethora of restaurants, shopping, medical facilities, Safeway and much much more. Home for sale at #902 318 26 AV Sw Calgary, Alberts T2S 2T9. Description: The home at #902 318 26 AV Sw Calgary, Alberta T2S 2T9 with the MLS® Number C4219150 is currently listed at $529,988.